Hayley Young. 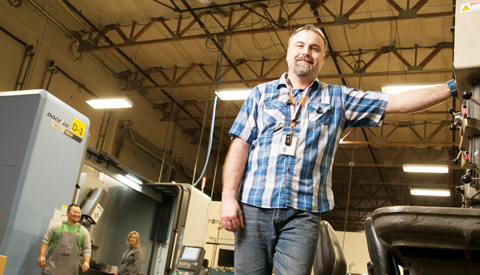 PICTURED: Dan Olson is manager at Auburn South, one of eight facilities Skills operates. Skills describes itself with a one-two-three mnemonic: one mission (creating a stable, rewarding workplace for people with disabilities), two bottom lines (financial and social) and three paths to achieve its goals (employing people with disabilities, offering vocational programs and serving as a role model/resource to the community). It could add that it does so with four business lines, including aerospace finishing, aerospace parts machining, business solutions (packaging, labeling, collating, light assembly and kitting) and technical services. Also, an aerospace internship program allows high school students to get real-world manufacturing work experience while earning credit toward their diplomas.